Now you can manually enable Wifi calling on OnePlus 6T Pie devices. Wi-Fi calling feature is useful to make phone call using a Wi-Fi connection instead of your mobile network. Not all carriers supported this Wi-Fi calling features. If your carrier doesn’t support call over Wi-Fi, you can try voice over IP service. First of all set up Wi-Fi calling in OnePlus 6T to make call over Wi-Fi. When you’re phone connected to mobile data, you’ll see Internet call or Wi-Fi calling option when try to make a phone call. When you’re not connected to Wi-Fi, your calls use your cellular data if activate. Follow below given step by step process to enable Wifi calling on OnePlus 6T Pie 9.0. When turn on Wi-fi calling in OnePlus 6T, you can use it when available in your device. Sometimes depends on carriers to activate such as Verizon wireless, T-mobile, AT&T mobile, Sprint etc. Here you can see SIM settings with SIM 1 and SIM 2. You can see Wi-fi calling option under enhanced communications section. By default turned off toggle in your OnePlus 6T device. Now you’ll make call over Wi-Fi in your OnePlus 6T Oxygen OS devices. If your carriers not supported Wi-Fi calling, try this method. Some services can make calls over Wi-Fi, such as VOIP. 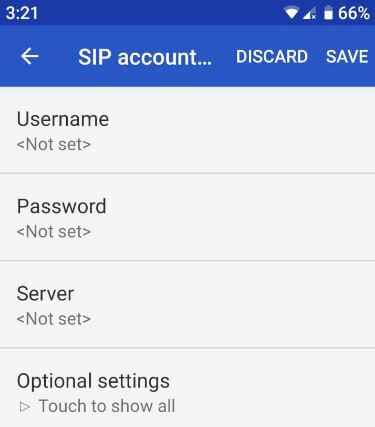 To do so, you need to add a SIP (Session initiation protocol) account to your phone. Now you can enable and use Wi-Fi calling in OnePlus 6T using mobile network. And that’s all. We hope this makes it clear how to enable Wifi calling on OnePlus 6T Pie. If you have any kind of trouble, tell us in below comment box. Stay and connect with us for latest updates. Thank you so very much for this information. I just received my OnePlus 6T McLaren. No one could hear me when I called them.. they said I sounded like a robot or no sound at all and breaking up.. found out, like my last phone it had ‘ Wi-Fi calling on by default. I just about went insane trying to find where on the phone was the option to turn it off. the standard instructions did not work.. This helped me greatly. it WAS in with the Sim card options.. NOT where they told me in wifi setting.